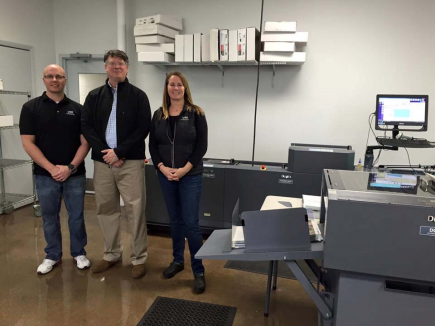 When it came time for Visual Image Photography (VIP) to transition to digital print, the Wisconsin native company chose to install the HP Indigo 5600. To further outfit their business for the future, they opted for the Duplo DC-646 Slitter/Cutter/Creaser and 350i Digital Booklet System. By offering easy finishing, the DC646 has helped VIP streamline their services into fewer steps then their previosu workflow. Their 350i Digital Booklet System allows their photo booklets to be fed through the DSF-220 Feeder, allows stitching and prepares the booklets for a flat, square finish with their DSS-350 Square spine module. The barcode reader has also helped them correctly and accurately process personalized photo booklets in record time. Thanks to their upgraded printing technology, VIP is now offering shorter turnarounds and less downtime for improved business flow.